It’s helpful to note that the “rules of the road” apply not to vehicles, or bikes, but rather to the people operating these things. A typical example is the rule for what to do at a stop sign, §28-855(B). “A driver of a vehicle approaching a stop sign shall stop…”. or used exclusively on stationary rails or tracks. that is propelled by the use of motor vehicle fuel. 4 and 5 of this title that by their nature can have no application. This is a cyclist’s fundamental right to the road; the equal of driver’s. Note well that it refers specifically to the rights and duties of the driver of vehicle — and NOT the driver of MOTOR vehicle, in fact the word motor does not appear at all in 28-812. It might surprise you to note that the phrase “motor vehicle” occurs only a handful of places in ARS Title 28, Transportation, with respect to how a driver must operate a vehicle. By far, most driver’s duties refer, as in the stop sign example above, simply to vehicle. Some references are incidental; lane and speed restrictions on motor vehicles weighing over 26,000 pounds (§28-736, §28-709). Another was intended to set minimum passing clearance when a motor vehicle overtakes a bicycle (§28-735). Two germane examples for cyclists are following distance, and impeding traffic. §28-730, “The driver of a motor vehicle shall not follow another vehicle more closely than is reasonable and prudent…”, without the word motor in this statute, pacelining would likely be illegal. Since reasonable people would probably agree that a couple of inches is an inappropriately small following distance. §28-704(A), “A person shall not drive a motor vehicle at such a slow speed as to impede or block the normal and reasonable movement of traffic…”. This is what I refer to as the cyclist’s second most fundamental right to the road, because if this statute were to apply to cyclists, then they would in effect be not allowed to use any road where traffic even might be impeded; regardless of number of lanes, width, presence or absence of a bike lane, or anything else. There is some detailed minutia [see footnote 2, here] revolving around what is meant by the “normal and reasonable movement” but that is immaterial to cyclists, since this section is inapplicable to them. Likewise, §28-701(E) “A person shall not drive a MOTOR vehicle at a speed that is less than the speed that is reasonable and prudent under existing conditions”, never applies to bicyclists. The point is that the phrase motor vehicle is used sparingly and deliberately to apply only to drivers of that type of vehicle, reflecting clear legislative intent. In the case of 28-704(A) to allow cyclists to use all roads even though motorists might sometimes be impeded (with some caveats: There is a specific allowance for prohibiting bicycles on controlled access highways, and other roads on a case-by-case basis). And the purpose of these laws is so that bicyclists can ride both legally and safely in the road according to best practices. 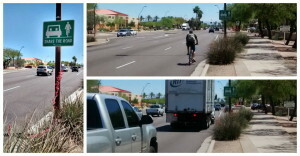 Arizona is one of 42 states (and the UVC) that makes it explicit that only motor vehicle drivers are subject to the impeding law; and in any event the impeding rule as interpreted must take into account the capability of the vehicle in determining if a violation has taken place; see Trotwood v. Selz, concerning an Ohio bicyclist, and Lott v. Smith, concerning a Georgia farmer driving a combine. Elliot Road, eastbound east of Priest Drive, City of Tempe. Sign placed by the city reminds users to “Share the Road”. Posted speed limit 45mph. Even the fastest bicyclists will be traveling well below the posted speed limit. This arterial, like most, has lanes which are “too narrow to share safely side by side”, and as such, cyclists going straight ahead are advised to ride near the center of the right-most through lane. Motorists wishing to overtake must change lanes (at least partially) to pass legally and safely. Bicyclists must obey the same traffic laws as drivers of vehicle, and they have the right of way under the same conditions as motorists. A Tempe police sergeant said he’s right. 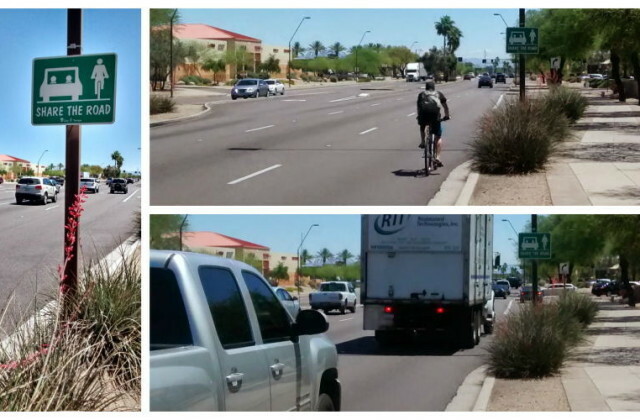 “Bicyclists can be in the same places as cars, as long as they are not impeding traffic,” Sgt. Steve Carbajal said. Besides being incorrect for reasons explained in this article, it’s bad because it infringes on bicyclists’ rights to use streets in the safest manner, which on many roads will of necessity impede motorists. Safety first, not convenience. – Impeding traffic rule: may apply to motor vehicles only. – Does not prohibit use of roadway at bicycle speeds. – Mountain roads: use turnout where there is a line of vehicles. Q1. What is an impeding traffic statute? Q2. Why doesn’t this law apply to bicycles? A2. It does not either because “the reduced speed”is normal bicycle operating speed or because the statute specifically applies to motor vehicles. When it is ambiguous, courts have said that it does not apply to bicycles using the road at ordinary bicycle speed. Q3. What if there is a long line of traffic behind the cyclist? Interesting because it involves impeding and a google self-driven car; which apparently operates on LSV/NEV rules (restricted to a maximum speed of 25mph, and only allowed on roads posted for 35mph and below). CA’s impeding statute has all the same provisions as AZ’s, except CA omits the word “motor” — which is irrelevant for a motorized vehicle. CVC 22400(a) clearly does not apply (drivers of vehicles not capable of going the speed of traffic are still allowed to use public streets and highways), so there is no conflict or confusion. The same principle applies to bicyclists using full lanes that are too narrow for a bicycle and a vehicle to travel safely side by side. The officer simply made a mistake. There were cars stacking up behind the Google car, which satisfies the “impeding” portion of the law. However, in this case with overlapping (and somewhat conflicting) laws, the officer exercised discretion and gave a warning.